On Tuesday 19th December, Grazia UK teamed up with Instagram to run a panel event focused on Diversity in Fashion. 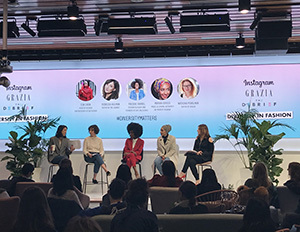 The panel was hosted by Instagram’s Head of Fashion Partnerships, and huge Instagram influencer, Eva Chen, who led the panel alongside Natasha Pearlman, Grazia Editor-in-chief. The event took place at the Facebook HQ in London, and saw Grazia readers and commercial clients in attendance. Readers could sign up via an engaged sciences application on the magazines’ website – the event sold out within a couple of days and those randomly selected attendees were notified. For those who weren’t successful, the event was streamed live on Grazia’s Facebook page!